It’s drizzly and gray and a touch chilly in the garden this morning. In other words: perfect. The garden is packed with recent transplants and just-started seeds and seedlings. Everything could do with a little drink. Even if today’s precipitation doesn’t amount to much, it’ll at least moisten the soil and encourage my just-planted nasturtiums to sprout. Speaking of sprouting, my pot of sticks has come to life! The ‘Scarlet Emperor’ runner beans are sprouting enthusiastically. Some of these are from last year’s purchased seed packet, but most of them are growing from seeds I saved from the ‘Scarlet Emperor’ plants in last year’s garden. Seed saving, for the win! That’s actually something I try to remember as I plant and tend this not-allowed vegetable garden. The neighborhood, and its impression of me and what I’m doing. I use that as a guide. Because — let’s be honest — I am breaking the rules here. And, I want to continue breaking the rules. The easiest way to do that is to grow a garden that makes people happy. Not quite as pretty when looking straight down, but still a happy and healthy clump of plants. That’s the red cabbage on the right. 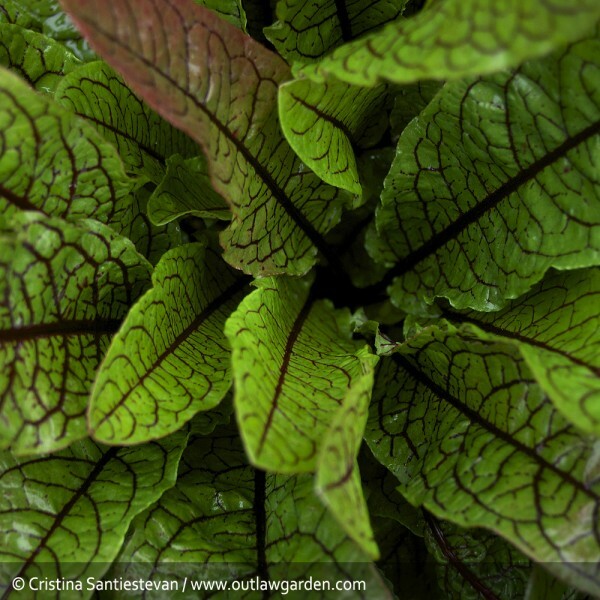 The green and red plants are bloody dock, which is also known as red sorrel. 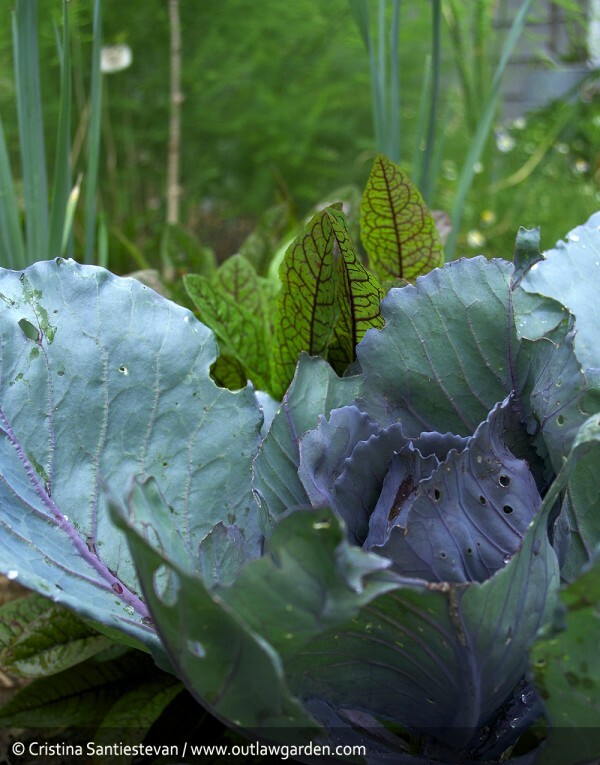 Pretty, perennial and edible — not a bad combination! 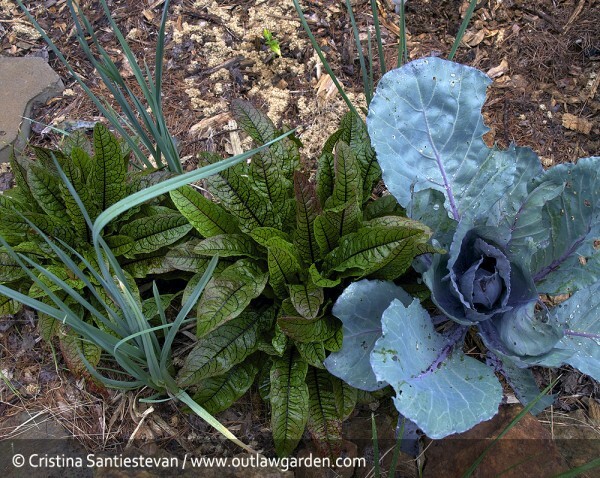 Then, there are three clumps of leeks in this planting. They stand tall above the other plants. Finally, in the background is a teeny tiny pepper seedling. There are actually two young poblanos back there — soon enough they will be visible from the street too, peeking out from behind the dock and cabbage. This is not the type of planting you’d see in a typical vegetable garden. The plants are much too close together (according to all the rules), and there’s no straight lines or clear rows. Incognito vegetable gardening involves a lot of coloring outside the lines and making it up as you go along. Such a fun plant! I definitely need to figure out how to cook with it. Any ideas? I’ve got a mixed patch of yellow, green and purple bush beans that’s coming along nicely. The plants are definitely more tightly spaced that the books recommend, but that’s ok. Yes, I want to harvest bunches of beans for fresh eating and freezing. But, I also want to grow a garden that bursts with life, and impresses the neighborhood. It’s a balancing act, I’m learning. 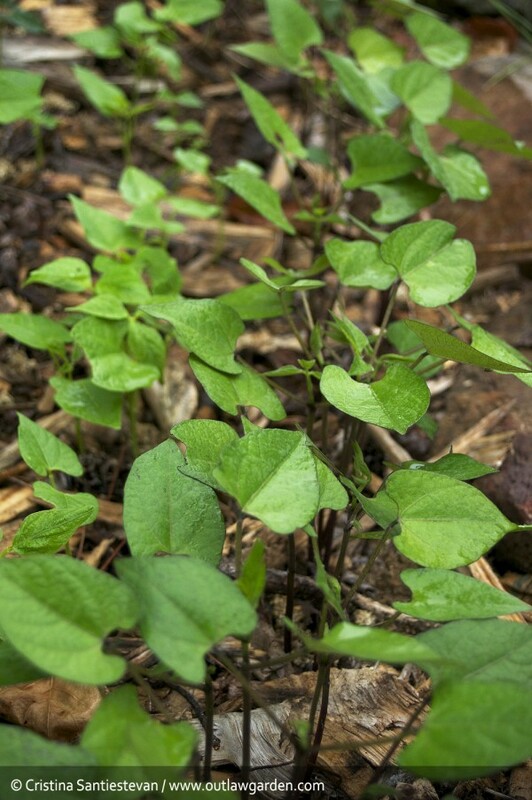 By the way, purple-podded bush beans are a great choice for edible landscaping. In addition to purple pods, I’ve found that most varieties also sport purple-tinted stems and purple flowers. Nice! Speaking of flowers, the blooms continue to burst. The Culver’s root is looking great. If you haven’t grown this native yet, I highly recommend it. 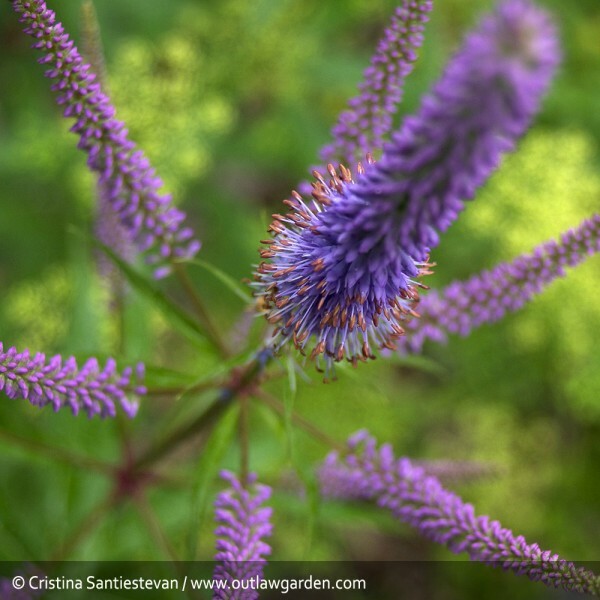 The various species and cultivated varieties range from about three to six feet in height, and erupt with these spikes of lavender flowers in early summer. Easy to care for, attractive, and the pollinators adore them. Definitely worth a try! By the way, the patches of yellow in the background there are the flower umbels on one of my parsley plants. They’re all done blooming, and have taken on this lovely yellow cast that illuminates the garden. Soon enough, I should be harvesting parsley seed! 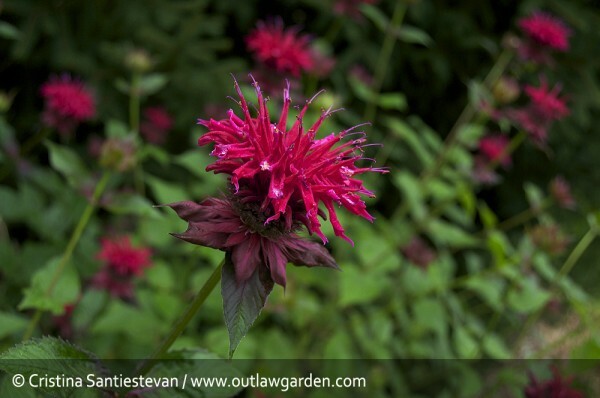 And, then there’s the monarda (aka. bee balm). Or, as I like to call it, hummingbird bait. I’ve got several clumps in the garden and on the wildflower hill, and they’re all just beginning to bloom. If I remember to keep the plants dead-headed, I should be able to convince them to bloom for a long time. Anything to keep the hummingbirds happy! The artichoke is blooming!! Holy crap, is that gorgeous or what!?! There’s no contest: This is definitely the coolest thing I’ve ever coaxed to bloom in my garden. It’s a shame we eat the unopened flower buds. Wouldn’t it be great if artichokes were like okra, and we ate the seed pods instead? Because, look, so pretty! And, that’s it for the weekly garden stroll. 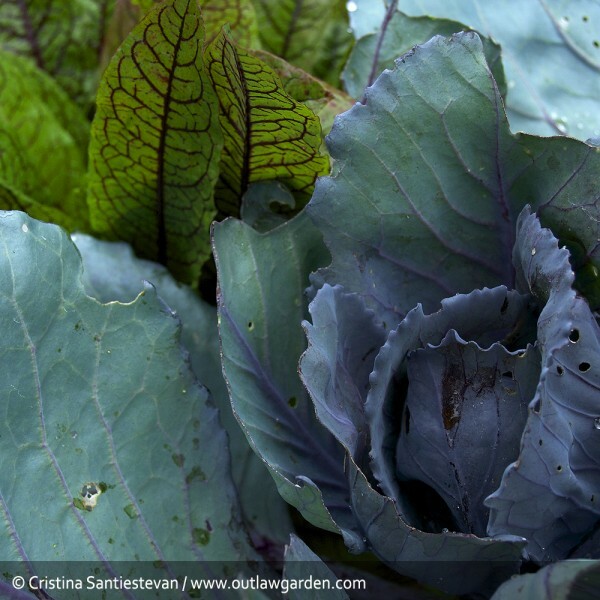 How are things growing in your garden? Hi there. I just wanted to drop by to say that I love your garden, I am trying to move towards a more permaculture style of gardening, although I rent,so forest gardening is out for the time being. I hope that my garden will start to look as pretty as yours. News is hitting us of a poor lady in Tulsa who is suing the council for shredding up the plants in her yard. I can’t quite believe it. I don’t really understand how there is the set up in the States that enables the local authorities to dictate what you are allowed to grow. It seems pretty short sighted to me, and a confusing example of nanny state (or city ordnance) politics, which seems to be resisted so vehemently at state and national level, but actively engaged in at a local level. I’d be really grateful for some insight as to how and why this works on private land. Yes, I’ve heard about the woman in Tulsa, and it’s just horrible what she’s going through. This war on gardens seems to be accelerating, although I’m not entirely sure why. You’re asking some good questions. I’ll have to see if I can’t track down some worthwhile answers. 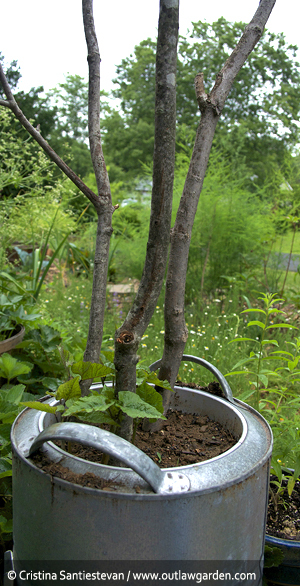 i love the tree sticks in the pot. looks great as usual! I love your garden! May I ask…why is it you are not allowed to grow vegetables whre you are? I’m new to your blog and I haven’t gone through all your past blogs to see if you explained why. I also wanted to let you know that I enjoy your posts. You are encouraging me to plant my own “path”! If you’re curious, you can check out the About section for more about the garden, the neighborhood, and how I’m growing edibles as discreetly as possible (while still totally flaunting the garden). It is encouraging that you’re still putting seedlings and plants into thr ground–makes me feel a little less far behind. My emperor scarlets also just popped up and i am hoping to use them to hide a rickety fence and entice butterflies and hummingbirds into the back corner of my own yard. Beautiful artichoke!!! Maybe I can entice some of them to grow her ein Michigan next year. Always happy to encourage other gardeners, Holly! 😉 Honestly, I never quite finish planting my gardens, and I’m perpetually in awe of those gardeners who get everything in (perfectly!) just when they should. I still have some sweet potatoes I haven’t planted (though I’ve already planted lots, so I’m not sweating it), and was just given two little heirloom tomatoes that I’ll plant tomorrow eve, once this dreadful heat breaks. 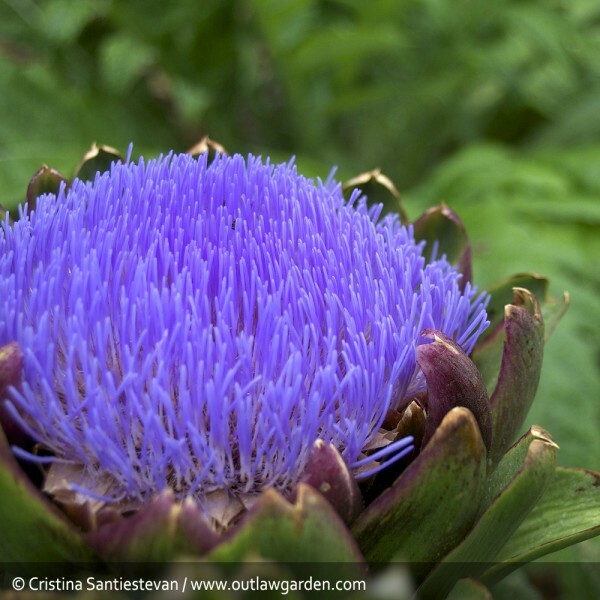 If you do decide to grow artichokes, you might want to look into the ‘Imperial’ variety. It’s specially bred to be best suited for more northerly climates, where the plants won’t survive the winter (I’m in Zone 7, and it’s iffy here). Most artichokes don’t flower until their second year, but something about the genetic makeup of ‘Imperial’ makes it easier to convince to bloom in its first year. Google should be able to tell you more. Good luck! 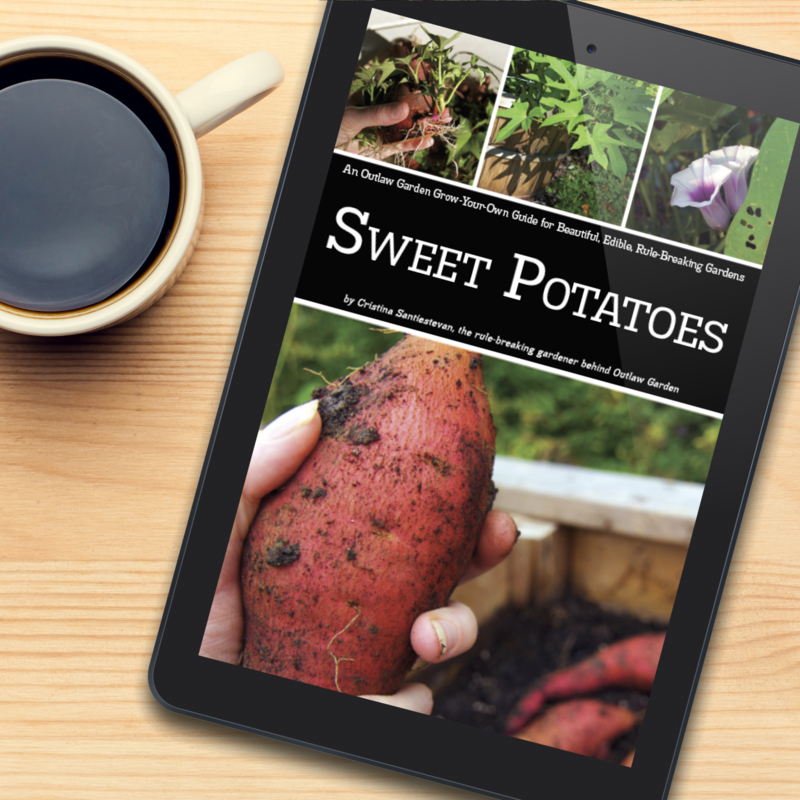 I found this blog via pinterest (one of the articles on growing sweet potatoes), and I love your garden. I don’t do much planting anymore. I used to help my dad a lot when I was younger. I don’t think I even like artichoke but now I want to grow some. I didn’t realise it was so gorgeous bloomed like that. Hi Cristina, That was a lovely post about the praying mantis egg case hatching out all the babies! I had that happen in college, by accident. I had found the case in winter, and carefully put it in my specimen box in my desk drawer. A few days later my desk was crawling with scores of itty bitty babies (that I rushed outside as quickly as possible)! Apparently the temperature coaxed them to hatch prematurely. I grew artichokes once in Virginia, too, on a whim. Yes, they were Globe Imperial. The majestic plants overwhelmed me with their beauty — their color, size and shape — and I only cut one small bud from one plant and left the others to bloom. I wondered how odd it was to have planted them intending to eat them, yet being unable to cut down their gloriousness (ha!) once they flourished. 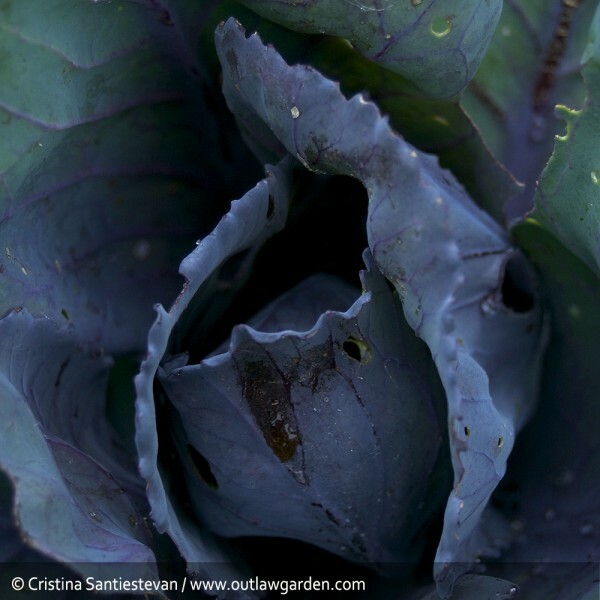 Love the blog almost as much as I love your creative gardening!